Construction of a biophysically accurate BL model. A, Our BL model was a cube structure comprised of 27,000 PNs and FSIs randomly distributed throughout. Local cell densities in 100 × 100 × 100 µm cubes (red = PN, blue = FSI) are illustrated for a typical case. For this example, PNs, the densities spanned 0–19,000/mm3 (median = 7000/mm3). FSI densities ranged from 0 to 5000/mm3 (median = 1000/mm3). B, A slice through the model shows the inhomogeneity of cell densities for PNs and FSIs. C, The dendritic processes of the neurons contained in a particular voxel are illustrated. These were randomly oriented and spanned several hundred microns as also shown in the three orthogonal views. D, (1) PNs and FSIs were distributed in space so that they spanned a volume equal to the area of the BL in the rat. 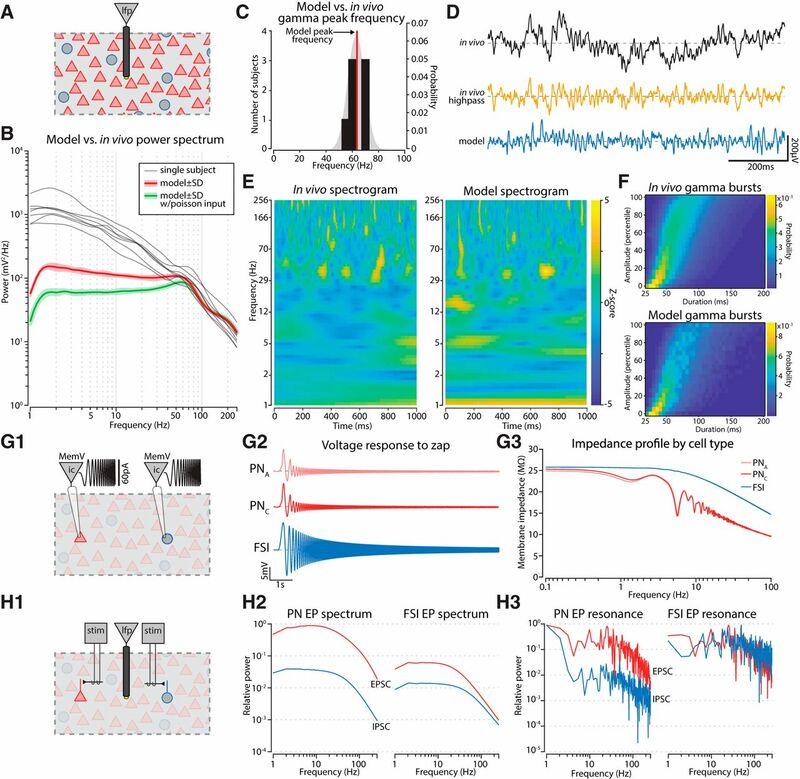 Virtual current clamp electrodes (ic) could be placed into any cell, and virtual extracellular electrodes (lfp) could be placed anywhere in the model volume. PNs are indicated by red triangles and FSIs are blue circles. (2) PNs and FSIs were connected among themselves and with each other. Extrinsic glutamatergic afferents fed onto both cell types. Neither FSIs nor PNs formed autapses. E, The relative proportions of the three cell types were determined by patching neurons in BL slices prepared from adult Long–Evans rats, the same age and strain used for our LFP recordings. The cutoff for determining which PNs exhibited adaption was set to 1.5, which was between the two peaks in the distribution of adaptation ratios. F, Example recordings from neurons in the slice receiving current injection were comparable to those of our model neurons. G, The firing rate distributions for neurons in our model overlapped with the mean rates reported from the BL in vivo in a previous study (Amir et al., 2018). H, Example spike waveforms recorded with a silicon probe in vivo. Red traces are from putative PNs, while blue are FSIs. The intensity of the color is scaled to the peak of the spike wave form. I, Left, For both a model PN and FSI we delivered a suprathreshold EPSC to the a-dend and recorded the extracellular AP at different distances along the long axis of the neuron, and either at 50 or 100 µm lateral. Near the cell body the field was negative, and it decayed rapidly with distance. Positive dendritic return currents were evident as well. The FSI extracellular spike wave form was both smaller and faster than the PN’s. Right, Subthreshold stimulation resulted in a much weaker extracellular wave form (note the scale bar) reflecting the EPSC (EP) that was negative going near the stimulated dendritic branch. J, (1) Directly overlaying the extracellular APs from both cell types illustrates that those arising from PNs were much slower than those from FSIs. Amplitudes were rescaled so both spike waveforms occupy the same vertical extent of the graph. (2) AP amplitudes were much stronger than EP amplitudes for both cell types. K, For extracellular APs recorded with silicon probes in vivo, we measured how their amplitudes decayed with distance. The drop in amplitude was fit by an exponential curve (black line). The gray region is the 95% confidence bounds. Measuring the decay in our model extracellular APs along the lateral axis, we found that it fit within the in vivo distribution. The model LFP exhibits gamma oscillations that are similar to those seen in vivo. A, The LFP was measured at the center of the model. B, The power spectrum of the model LFP (red) is compared with the spectra from the BL of seven rats during QW (gray). Driving the model with a homogenous Poisson input (green) still induces gamma oscillations. Shaded regions denote SD. C, The frequency where the gamma bump peaked was measured for each subject (black bars), the probability distribution was fit with a normal curve (gray). The model’s peak frequency was 64 Hz (red line), which fell within the in vivo distribution. D, Gamma oscillations occurred as intermittent bursts in vivo and in the model. There was a stronger low-frequency component in vivo (black), but filtering that out (yellow) revealed a comparable signal amplitude to our model (blue). E, The model had a similar wavelet spectrogram to that observed in vivo. F, Gamma bursts were detected in the wavelet power spectrograms and categorized based on their amplitude percentile and duration. The relationship between these features was characterized by a probability distribution. Bursts arising from the model or in vivo exhibited a similar distribution of durations when stratified by amplitude, with higher amplitude bursts tending to last longer. G, (1) Each simulated cell type was placed in current clamp and driven with a frequency modulated sinusoid. (2) Neurons responded to this input with an oscillating membrane potential that decayed with increasing frequency. (3) The impedance spectrum of the neuronal responses did not exhibit any peaks in the gamma band. H, (1) An extracellular electrode was placed near either a PN or FSI and synaptic inputs to those neurons were driven (stim). (2) The extracellular field responding arising from a single EPSC or IPSC was measured for each cell, and normalized to the strength of the PN EPSC. There was no bump in the gamma band. (3) Driving the synaptic inputs with Poisson trains at rates indicated by the x-axis did not show any obvious boost in power in the gamma range either. Spiking in the model was entrained to the gamma rhythm similarly to cells in vivo. A, Example trace of the calculated extracellular field from the center of the model and a raster plot of corresponding spiking from neurons within 300 µm (1026 PNs, 111 FSIs). Gamma bursts were evident, particularly following bandpass filtering around the peak gamma frequency. The group firing rates of FSIs and PNs exhibited modulations by the gamma rhythm, with the effect being more evident for FSIs. Spikes from individual neurons (each row is a different cell) did not spike on every gamma cycle. B, Left, Spiking from units (AP) within 300 µm of where the extracellular field was measured (LFP) were associated with the phase of the ongoing gamma oscillations. Right, Distribution of gamma phases when spikes occurred for three example PNs and FSIs, sorted by the strength of their phase locking. Dashed gray schematizes the corresponding gamma cycle. C, Left, The distribution of mean phases across each cell type. Both types of PNs preferentially spiked near the trough of the gamma oscillation, while FSIs spiked shortly thereafter during the ascending phase. Right, The distribution of phase-locking across cell types matched what we found for BL neurons in vivo. D, Left, Spiking was sampled from neurons spanning 800 µm away from the point where we measured the extracellular field, and neurons were sorted by their distance from that spot. Right, The farther a neuron was from the site were gamma was measured, the less phase-locked it was. Black lines are exponential fits. 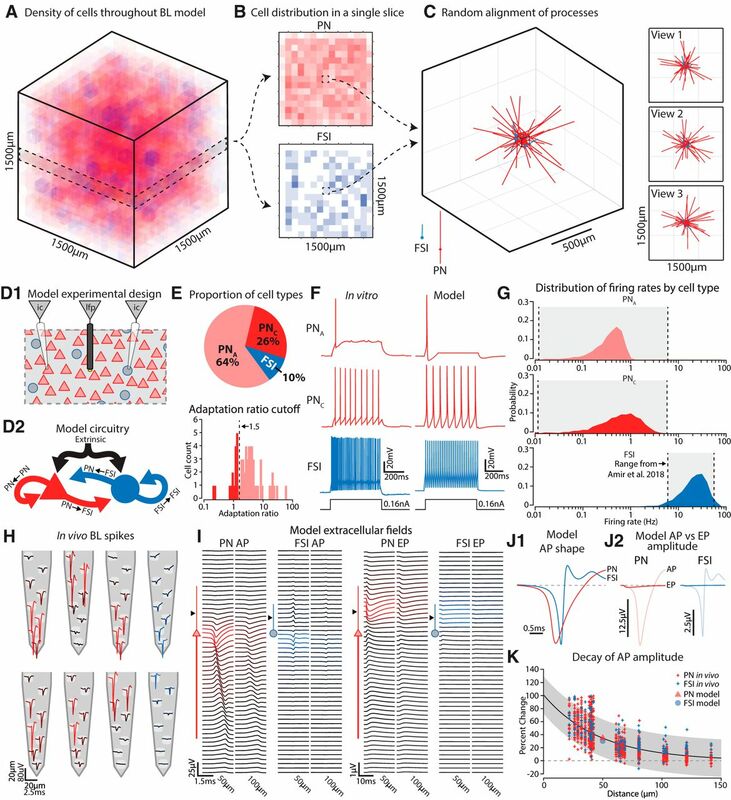 E, Left, The extracellular field arising from individual neurons was singled out to examine their distance-dependent contribution. 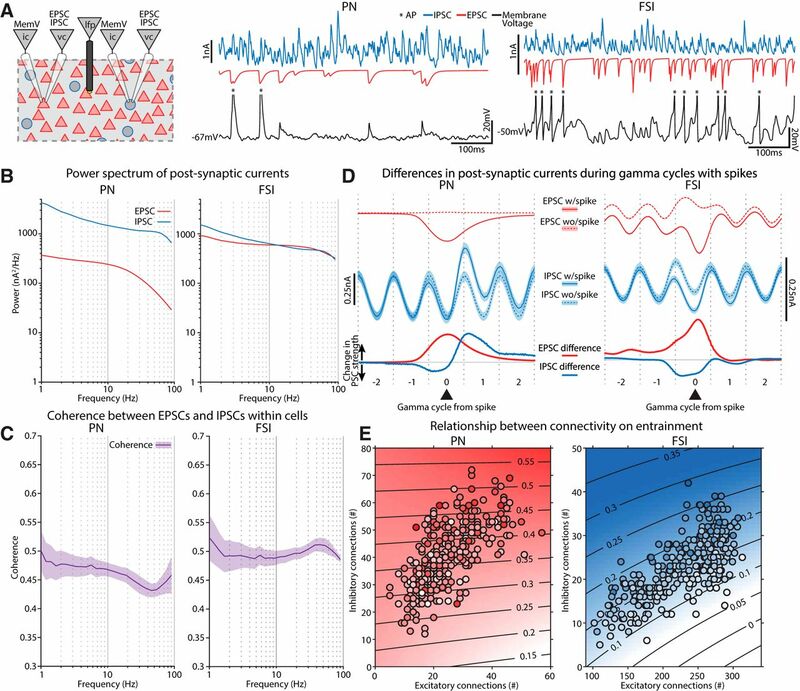 Right, Neurons farther from the recording site contributed less to the extracellular field, and this fell off faster than the decay in the resultant vector in panel D.
Connections between PNs and FSIs were critical for genesis of the gamma rhythm. A, Removal of connections from FSIs to PNs. (1) Comparison of power spectrum between the original and perturbed model. Gray traces are derived from the unmodified model and are the same across all graphs in each row. The green traces are the power spectrum with the particular connection removed. 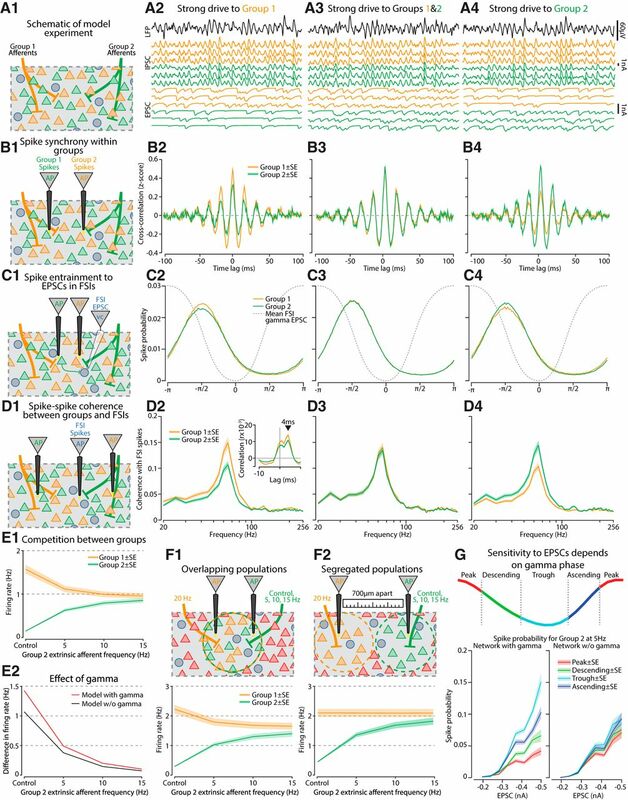 (2) Entrainment to LFP oscillations for different cell types. (3) Average modulation of FSI firing rate triggered on PN population bursts. B, Removal of connections from PNs to FSIs. C, Removal of connections between FSIs. D, Removal of connections between PNs. For all graphs the solid line is the mean while the shaded region denotes ±1 SD. EPSCs and IPSCs entrained neurons in the gamma band. A, Left, For PNs and FSIs we measured the membrane voltage (ic) and their transmembrane currents while voltage clamped (vc) at the reversal potentials for either EPSCs (0 mV) or IPSCs (−75 mV). Middle, Traces from an example PN. In addition to the transmembrane currents and voltages were recorded, we also bandpass filtered the EPSC and IPSC traces around the gamma peak. Right, Examples traces from an FSI. B, The mean power spectrums of the EPSC and IPSC traces for each cell type. PNs showed greater power for IPSCs across all frequencies compared with EPSCs. FSIs had similar power levels across the spectrum for EPSCs and IPSCs. The spectrum of IPSCs from both cell types contained a bump in the gamma band. C, The coherence of the EPSCs and IPSCs for each cell type. PNs had a dip in coherence around the peak gamma frequency, while FSIs showed a prominence. Shaded regions denote SD. D, Synaptic currents were aligned to the phase of gamma cycles and centered on ones that either had, or did not have, spiking (thin blue and red lines, solid lines from cycles with spikes, dashed for cycles without spikes). The difference in the PSCs between the spike and no spike conditions is shown below (thick red and blue lines). IPSCs were modulated by gamma phase for both cell types, while only FSIs exhibited modulation of their EPSCs to gamma. E, For each cell we plotted the number of excitatory (x-axis) or inhibitory (y-axis) connections they received and their corresponding entrainment. Each scatter point is a different cell. The shaded background is the result of a linear fit that estimates the resultant vector strength based on the number of inhibitory connections, excitatory connections, and their product (interaction term). Contours in black indicate the actual resultant vector values associated with each color. Spatiotemporal properties of gamma bursts. A, Left, A 9 × 9 × 9 array of electrodes was inserted into the model and the envelope of the gamma band was extracted. Right, A cube of amplitude values was generated and short lasting, spatially localized, increases in gamma power were readily evident. B, We examined the properties of these bursts, in particular their (1) amplitude, (2) duration, (3) phase synchrony at their peak, (4) number of sites they encompassed, (5) length of the path they took through the BL from initiation to termination, and (6) speed that they traversed that path. 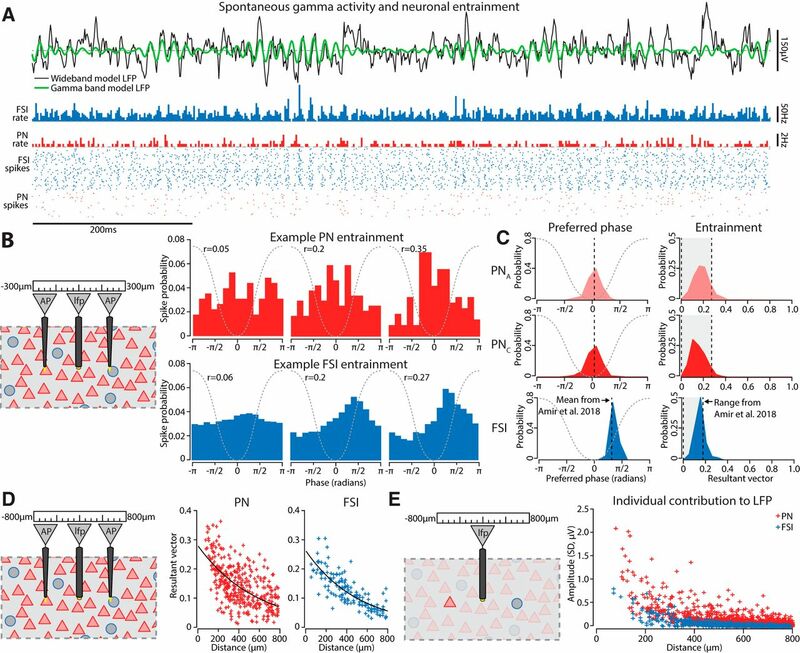 Gamma promoted synchrony between PNs responding to extrinsic afferents and the competition between weakly and strongly driven populations. 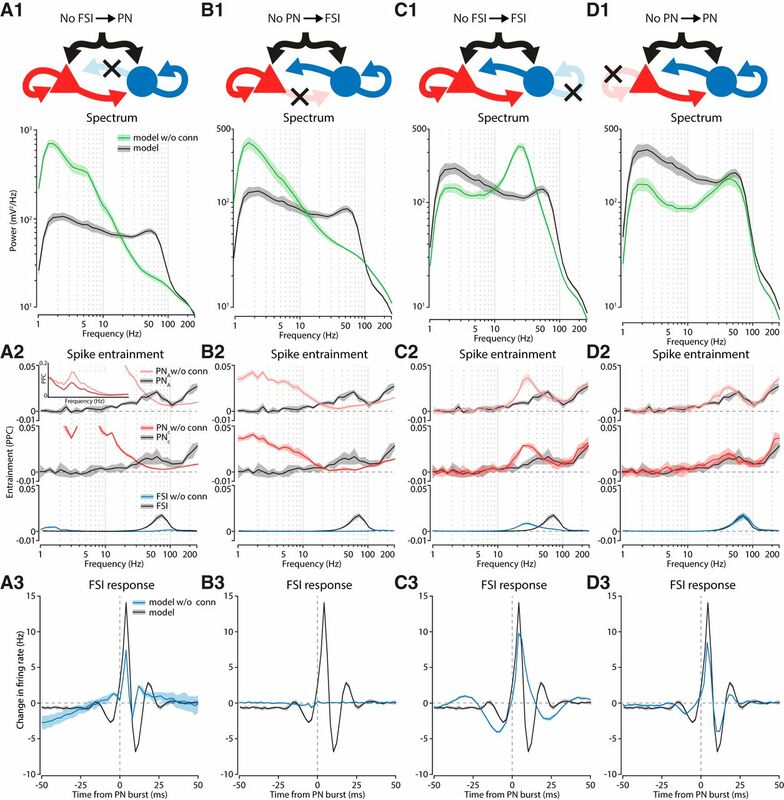 A, Two separate ensembles of PNs were targeted by extrinsic afferents (group 1, orange vs group 2, green), that received different subsets of afferents. Groups could be driven independently, with (2) group 1 receiving 20-Hz stimulation while group 2 had 5 Hz; (3) group 1, 20 Hz and group 2, 20 Hz; or (4) group 1, 5 Hz and group 2, 20 Hz. B, (1) Spikes were recorded from both groups of PNs and (2–4) we calculated their cross-correlation functions. C, (1) Spikes from PNs and the mean EPSC across all FSIs were recorded. (2–4) Probability histograms of the EPSC gamma phases associated with spiking from either group 1 or group 2. The strongly driven group exhibits greater entrainment. D, (1) The coherence between PN spiking and FSI spiking for each group. (2–4) FSIs were more coherent in the gamma-band with the population that received the strongest afferent drive. Inset, PN preceded FSI spiking by 4 ms on average. E, (1) Group 1 receives 20-Hz extrinsic drive while group 2 receives a varying amount. Increasing the firing rate of extrinsic afferents onto group 2 diminished the firing rate of group 1. (2) The difference in firing rate between these groups was weakened when connections from PNs to FSIs were removed. F, Analysis of competition between groups in the full model when they either (1) fully overlap or (2) are entirely segregated in space. G, top, Gamma cycles were divided into four phases and for each phase the spike probability was measured as a function of the EPSC strength. Bottom left, For the weakly driven group there was increased sensitivity for EPSCs during the trough and ascending phases of gamma, but a dampening of responsiveness during the descending and peak phases. Bottom right, When connections from PNs to FSIs were removed, the discrepant sensitivities for EPSCs across the four phases were diminished. Graphs are either mean or mean ± SE when a shaded region is present. , where Del denotes calculated conduction delay (ms), Dis is the intersoma distance (µm), v denotes conduction velocity (mm/ms, 1 mm/ms was used in this study), minidel denotes minimal conduction delay (minidel = 0.8 ms was used in this study), fluc denotes random fluctuation of conduction delay [ms, fluctuation of uniformly distribution of (−0.1,0.1) ms was used in this study], and dt denotes simulation time step, with dt = 0.05 ms was used in this study. Data is from in vitro BLA reports (Woodruff and Sah, 2007) limiting connectivity from/to FSIs to within ∼300 μm (also, see Cammarota et al., 2013).